I will be leaving soon for CHA. What excites me the most is getting to meet talented artists IRL. Another idol I will be meeting is Carole Burrage. She has an awesome personality. I’m so impressed with her creations, her ability to make me pull out a dictionary and educate myself with new words when I read her blog/comments…just an all around sweet lady. Carole sent me this b-day RAK. I love the coordination of this card. PERFECT!!! You can say I am one with tons of idols. I look forward (nervously overwhelmed) to traveling to CA. Thursday evening, I made the mistake of requesting at the salon to just color my hair back to its natural root color. My hair grows extremely fast and it’s a lot of maintenance (and $$) to keep up with it. OMW!! There is NO WAY this is my natural color. I am now a dark brown with some tints of warm red. I have always had a plain ash color. My little Ethan still is looking at me wierd. I mean, it looks good. I just can’t get used to it yet. Maybe it’s denial. SUPPLIES FOR ATC ALL SU! STAMP SETS USED: All in the Family, Bitty Birthday, Short & Sweet, and Classic Backgrounds. CARDSTOCK USED: So Saffron, Cutie Pie DSP, Purely Pomegranate, Shimmery White. INKS USED: Stazon Jet Black, Wild Wasabi, Bashful Blue, Purely Pomegranate, So Saffron. ACCESSORIES USED: Soft Subtles Brads Assortment, Ticket Corner Punch, 1/2″ Circle Punch, Horizontal Slot Punch, Aqua-Painter, Bashful Blue Striped Grosgrain Ribbon, Crystal Effects. I love that little ATC card! That highlighted tiny cupcake is too cute! And I love that we now can check out your art up close by clicking on it. Your RAK looks wonderful too! 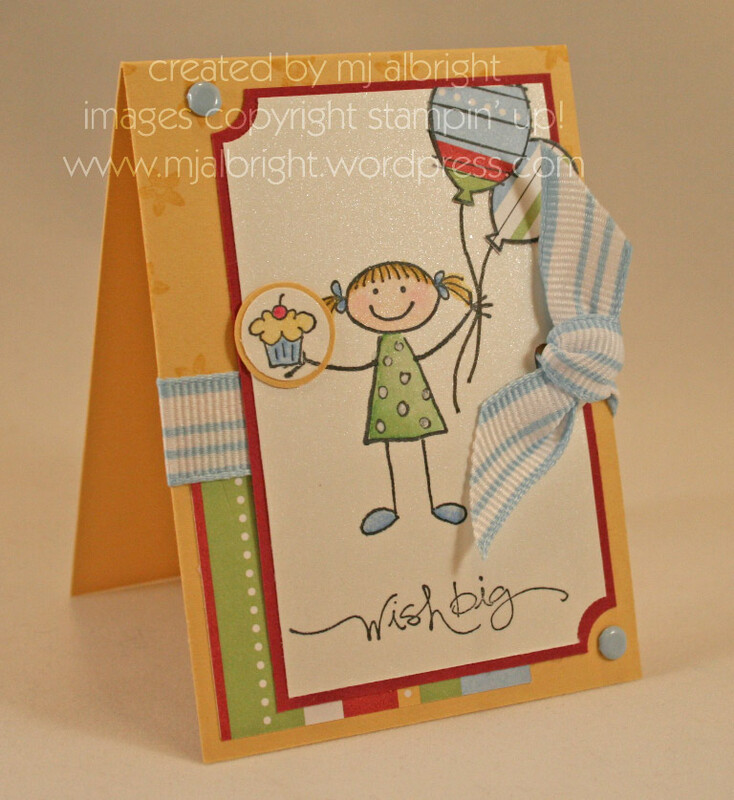 Your ATC is sooooo adorable, and Carol’s card is very pretty! I’m sure the feeling is mutual when others will be meeting you, as you’re a fantastic artist!! Have fun!! Have fun at CHA and meeting those girls! What an experience it will be….take it all in!! I need to do my hair back to natural too but it’s been light for so long, I think it will be a SHOCK like it was for you!! Oh MJ… you are too sweet! Your idol??? No… you’re my idol! The ATC is absolutely darling! I am so looking forward to meeting you! You’re cracking me up! Me? YOUR idol?! You have that backwards, sister!!! Thanks for making me smile, though, and we are going to have a blast in LESS THAN A WEEK (can you believe it?!)!!! Hugs!!! OH you’re so lucky to be attending CHA! How fun! Mary Jo, I was totally inspired by this ATC. I used it for the SCS color challenge this week (http://stampnscrapwithval.com/?p=137)….thanks for sharing your amazing talents!